How do I manage developer keys for an account? As an admin, you can manage developer keys for root accounts. You can manage the status for individual developer keys and control direct access to specific API endpoints for third-party tools. Newly-created developer keys default to off in an account. Developer Keys is an account permission. If you cannot view the Developer Keys link in Account Navigation, this permission has not been enabled for your user account. Although new keys are disabled when created, keys created prior to July 14, 2018, have been turned on by default to ensure uninterrupted access. Instructure does not review vendors prior to issuance of global developer keys, though specific vendor information is required. You should review your list of inherited keys to ensure that only institution-approved keys are active. To determine which developer keys are being used in your account, run the User Access Tokens report. The Developer Keys page defaults to the Account tab, where you can view the Developer Keys for your account. Each key shows the Key Name , Owner's Email , Details , Stats  and State . To view inherited keys associated with your account, click the Inherited tab . Inherited keys are keys created and managed at a global level by Canvas. You can manage the state of inherited keys for your account. However, if a key is grayed out , it has been enabled globally and cannot be modified on a specific account level. To deactivate a key, click the Off button . To edit a key, click the Edit icon . To delete the key, click the Delete icon . 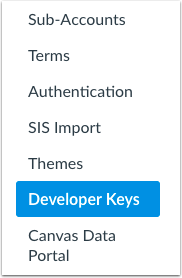 Note: If your institution has not enabled the Advanced Developer Keys feature option, you can deactivate keys by clicking the Lock icon. When a key is deactivated, the key is inactive. Deactivated keys are indicated by the Off button . To reactivate an inactive key, click the On button . To add a developer key, click the Add Developer Key button. 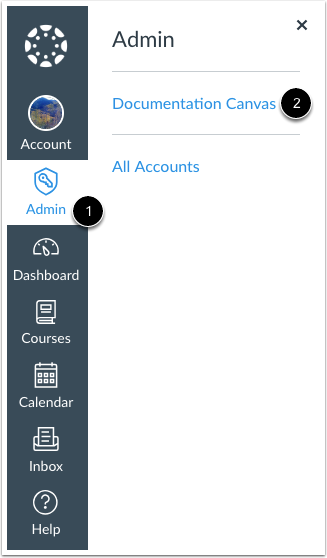 Previous Topic:How do I enable Equella for an account? Next Topic:How do I add a developer key for an account? Table of Contents > Integrations > How do I manage developer keys for an account?